The Pennsylvania Fish & Boat Commission (PFBC) is launching a new series of collectible products that are a must for every angler. While we know that you’ll want these for yourself, remember that they also make fantastic gifts. Imagine the attractive reminder of dropping a line into your favorite fishing spot with a metal sign adorning your home or office. A cup of your favorite hot beverage will most assuredly taste better in a PFBC mug. And, who can resist wearing a t-shirt or sweatshirt with our 150th anniversary logo? In order to purchase this button you must have a valid current PA fishing license from the PFBC, whi.. In order to purchase this button you must have a valid current PA fishing license from the P..
Collector calendars feature the vintage artwork of the Pennsylvania Angler & Boater Magazine cov.. Your set of keys will never be the same with this official PA Fish and Boat Commission 150th anniver..
Add to your collection this 150th anniversary round aluminum collector sign. A percentage of the sal.. Your coffee will taste great from this official PA Fish and Boat Commission 150th Anniversary Mug. &..
5.5" Round Durable Flexible Magnet.. Your coffee will taste great from this Born To Fish 150th Anniversary Mug. A percentage of you.. 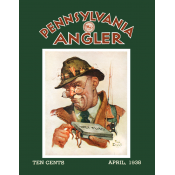 These 8"x12" collector aluminum signs feature the vintage artwork of the Pennsylvania Angler & B..